"The Master of Papal Liturgical Ceremonies -- Msgr Guido Marini -- has announced that Pope Benedict XVI will use a "fiddle back" chasuble for the Mass of Epiphany on 6 January. 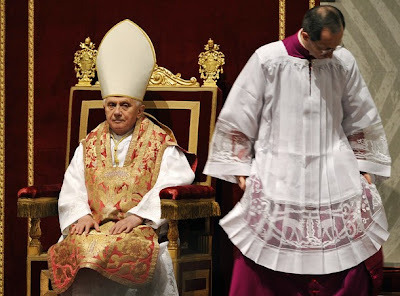 "In an article in today's "L'Avvenire" [the daily paper of the Italian bishops], Msgr Marini also said the Pope would not wear a cope for the Urbi et Orbi blessing on Christmas Day. He said the Pope would instead wear the mozzetta and stole. Undoubtedly, this will be the ermine-trimmed winter mozzetta...."
The Christmas #1 = Hallelujah X 2?